On the night of the Holy Nativity, Mary gave birth to Jesus in a manger, surrounded by lowly animals and humble shepherds. One such animal, the donkey, was present at the birth and had the honor and blessing to witness the beginning of what she called the Great Miracle—the life of Jesus Christ. Easter Day Alphabet is a simple way for children to learn more about the origins of popular holiday happenings while mastering their ABCs. Did you know that people believed playing games with eggs would help their plants grow? That white Easter lilies were brought to America from Bermuda more than 100 years ago? Or that boiling eggs with onion skin dyes them yellow? Paperback. This breakthrough children’s book by Sydelle Pearl will quickly find a place in Jewish holiday traditions. In five original tales, each relating to an important Jewish holiday, Elijah aids those in need, while challenging those who have lost their faith. The young prophet is summoned by God to wander the earth for a three-month period in order to observe the Jewish people’s handling of the Torah. Hardcover. In this tale, a young Ice-Age boy plays a key role in the survival of his band more than twelve thousand years ago. Eyr’s band is hungry and in need of new skins. Eyr dreams of killing the great wooly mammoth with his sharp spear. Taking only his cape, his knife, his spear, and a smoldering ember, Eyr sets out to become a man and save his band. Hardcover. In this tale, a young Ice-Age boy plays a key role in the survival of his band more than twelve thousand years ago. Eyr’s band is hungry and in need of new skins. Eyr dreams of killing the great wooly mammoth with his sharp spear. Taking only his cape, his knife, his spear, and a smoldering ember, Eyr sets out to become a man and save his band. Did you know that Jean Baptiste Pointe du Sable founded what was to become Chicago? That Charles Richard Drew invented a method of preserving plasma for blood transfusions? Or that Phyllis Wheatley wrote a poem about George Washington, and as a result was invited to meet him? Hardcover. Covering issues of civil rights, sports, education, and the arts, Famous Firsts of Black Women: 2nd Edition is a detailed account of courageous and daring black women who have changed the course of American history. Featuring twenty women, it describes the triumphs of these heroines, together with the obstacles they faced. This collection of biographies describes their lives from as far back as the 1700s right up to the present day. On August 24, 1942, just a few days before she entered Thereseienstadt concentration camp, Valli Ollendorff wrote this letter to her middle son. Secure in the knowledge that Ulrich was safe in America, and fearful of what the future held for her, Valli poured out her fear and longing, as well as her love and hope, in this brief document. Valli died less than two months later and her remarkable letter was lost for forty-three years. Now, thanks to the courage and generosity of Valli’s descendants, families worldwide can share its universal message. In this, her second cookbook, Gail Ashkanazi-Hankin offers a wide variety of delectable, yet healthy, kosher dishes to please any palate during the many Jewish festivals and on any night of the year. While creating and compiling these reduced-fat and reduced-calorie recipes, Mrs. Ashkanazi-Hankin met many talented Jewish cooks throughout the world, including those from the Ashkenazic and Sephardic communities. Who needs eight flying reindeer when Santa has a shiny red fire truck? It’s the Christmas Eve shift at Firehouse One, and all the firefighters are sitting down to bowls of hot chili when an old fireman stops by for a bite to eat. No sooner than it takes for the old man to finish his chili, the alarm sounds and the firemen have to leave to fight a fire. They work through the night and return, tired, and begin to ready their equipment for the next call. Hardcover. 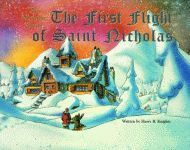 As parents and grandparents, we know that timeless tales generate endless questions about our holiday traditions, such as “How do reindeer fly?” “What is the magic of silver bells at Christmas?” “What is the Spirit of Christmas?” “How does Saint Nicholas visit so many children in just one night?” Hardcover. Chef Paul Prudhomme refers to Frank Davis as the “number-one authority on cooking and eating the fresh fish in Louisiana.” He has written the definitive books on cooking seafood and now Frank Davis reveals how and where to catch the big ones. Paperback. Over South Carolina’s capitol dome fly three flags: the United States flag, the flag of South Carolina, and the Confederate battle flag. This unique distinction among American capitols has led to its fair share of controversy. The battle flag often evokes as strong emotions today as during the War for Southern Independence. Paperback. “Marse Robert” is one of the endearing nicknames by which General Robert E. Lee was called by his men. This book is the account of Robert Stiles’ experience as a soldier during the Civil War. He traces his own story, giving personal significance to the battles fought and the time he spent under General Lee’s command. A restatement and rediscovery of the intended meaning of the United States Constitution, this exhaustive volume closely examines the document as originally framed in 1787, implemented in 1789, and amended in 1791, 1798, and 1804. Tracing each provision of the Constitution to its historic roots, John Remington Graham presents a focused yet comprehensive reading of the document, exposing its true legal meaning in a manner never done before. While almost every male can biologically father a child, there exists a vast difference between fathering and being a father. An inspirational resource for fathers, this guide provides spiritual guidance drawn from the wisdom of King Solomon. Evangelist, program coordinator, and father Jerry Drace invites dads to live by example and raise their children by showing them love, establishing clear boundaries and rules, and offering security and consistency. Gaston® Goes to the Kentucky Derby teaches children about the grand festival of the Derby in Louisville and the challenges all the riders face to make it to the most esteemed horse race in the country. Peppered with humor and seasoned with Rice’s colorful artwork, this is a delightful volume for young and old and a must-have addition for anyone collecting Rice’s books. Hardcover.